Submitted by wscaswell on Sat, 02/03/2007 - 9:13pm. These bridges are from across the United States and Canada. 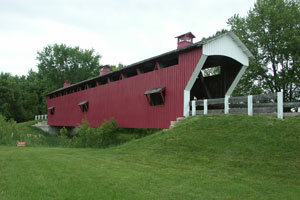 The file lists the covered bridge name, river crossed, year built and World Guide Number as assigned by the National Society for the Preservation of Covered Bridges. Original file submitted by veenstra. New file submitted and maintained by wscaswell from 9/6/2013. Deleted Kelly Bridge in Quebec after it was lost to arson. Removed Honey Run Bridge which was consumed by a wildfire on Nov. 8, 2018. Removed French Village and Bell bridges in New Brunswick. Both recently demolished. Removed Bob White Bridge in Patrick County, VA. Bridge was destroyed by floodwaters in September 2015. Updated details for Schlicher's Bridge in Lehigh County, PA after it was rebuilt in 2014. Updated location for Peter Jonah Bridge in Hillsboro, New Brunswick after the bridge was moved.